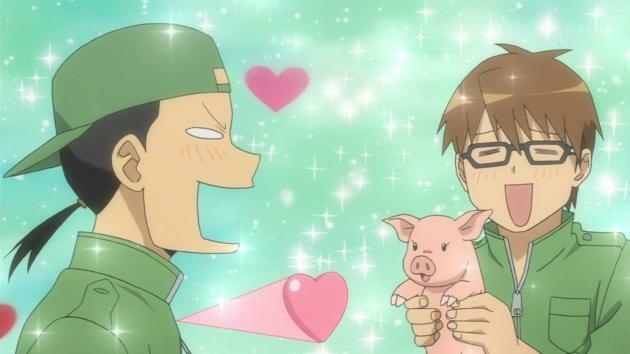 Oh yes, Silver Spoon. Hachiken, a disinterested city boy, goes to a remote agricultural high school in Hokkaidou. Yes, this show reminds me of that Fuji-TV show, Mutsugorou’s animal kingdom. I used to watch that show all the time when I was a kid, and I also wanted to visit Hokkaidou because of that. So, yes, as a kid, I dreamed I wanted to go to Hokkaidou to meet Mutsugorou-san. Mutsugorou-san (Hata Masanori) was my childhood hero. He had a special charisma to communicate with animals. That was really amazing. 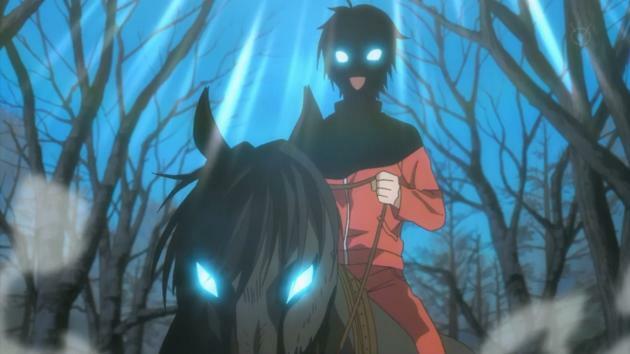 I mean, I even have trouble communicating with humans like Mokocchi of WataMote does, so I don’t know how Mutsugorou-san can manage to communicate with lower creatures like horses and pigs. Oh yes, Krista from Attack On Titan is like a young female version of Mutsugorou-san, she has a charisma to attract horses (and also pigs like me, i.e. 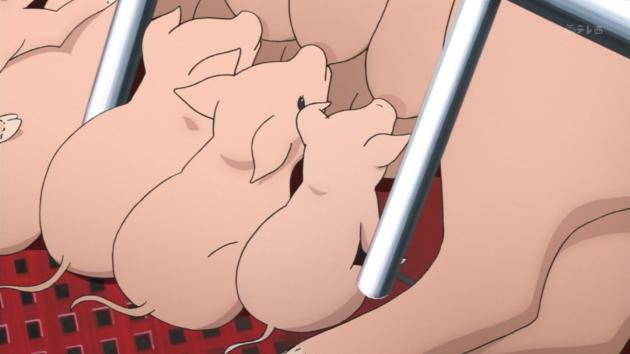 moe pigs). Yes, she can naturally communicate with animals. Even Reiner acknowledges that ability, that God-sent gift of Krista. I think if I’m human, I can never have skinship with Krista, so in order to have skinship for sure, I need to become a horse, so she can mount on me, that’s how I can secure skinship with her. Yes, skinship is the ultimate form of communications. In fact, Mutsugorou-san employs skinship a lot with animals. Ahh, I feel so sorry for the smallest piglet that has lost the survival of the fittest. “Buta-don (Pig Bowl).” That’s what Hachiken named that piglet. The first one to get slaughtered to be pork. You know, in animal world, there is no socialism, so no welfare to take care of the weak, totally social Darwinism. In human world, we have socialism, at least, for people who were unable to find works in the capitalist market, thus become freeter, NEET, or squatters. Pigs don’t have money, so there aren’t taxes to collet for welfare or donations to collect for charity. Simply there’s no safety net. 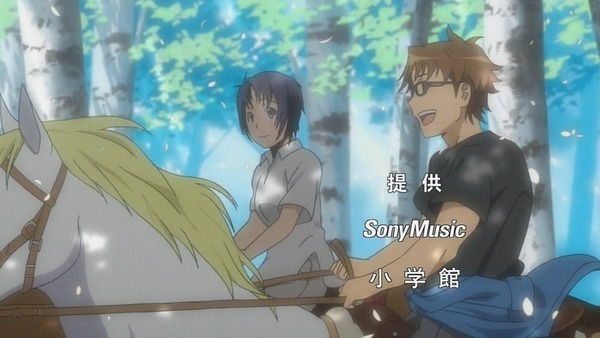 Hachiken joins the equestrian club at the farm school because he met Mikage, a cute equestrian girl. She got a short hair, and her personality is friendly, open, and kind. Ahh, farm girl! Idyllic girl that I yearn. Of course, who wouldn’t fall in love with that kind of girl? Not like these stuck-up girls in the city. So funny that when Mikage appears at first, Hachiken screams, “Seikimatsu Hasha (世紀末覇者 the ruler of the end of the century)!” Referring to Ken-ou (Raoh) from Fist Of the North Star. 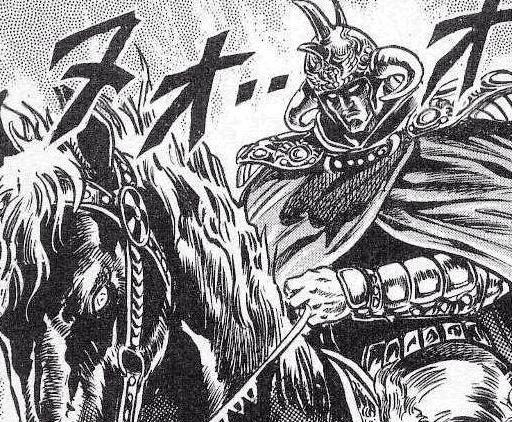 Yes, that huge black horse is a trade mark of Raoh, and alas, the original seiyuu of Raoh was in the episode too, the legendary Utsumi Kenji! So, yes, princess on a black horse! And she waves when she realizes that you are here. Jeez, so cute, I want to get that girly hand-waving too! That would surely bright up my life! Oh yes, Hachiken’s fantasy with Mikage, so funny. Mousou-zoku (fantasy tribe) we are! 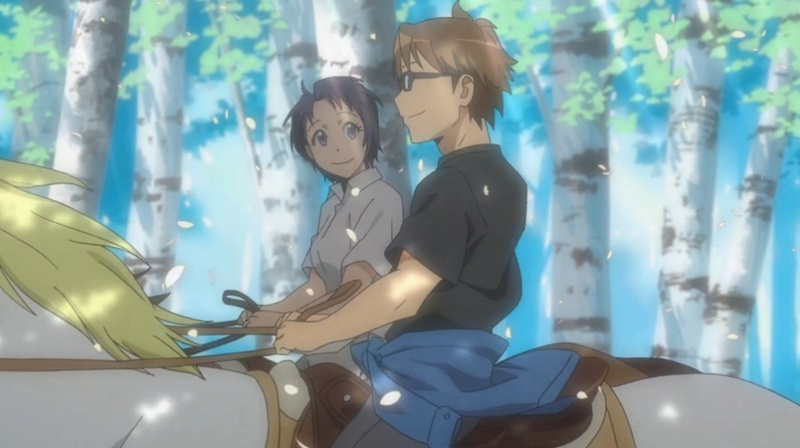 Mikage is really kind, she tutors Hachiken that horse is a sensitive, delicate, shy and timid animal. Oh yes, soushokukei (herbivore)! Exactly like me! So, yes, I rather be a horse than a pig, if I’m a pig, I can never have skinship with Mikage, destined to drown in a lake, but a horse, yeah, Mikage will have skinship with me. Please mount on my back! Hihiiin! But I want to have both Krista and Mikage ride on me, can’t stay monogamous, as the famous Japanese song from Kurosawa’s Ikiru say, “Life is short. Go have romance!” And that motto is also used by Ashely Madison, “Life is short. Have an affair!” Yes, Mokocchi from WataMote says, “date as many as you can.” Or Director Watanabe says, “pick up as many girls as you can.” I have been picking up many girls in 2D! But why farming anime? There is a farming boom among young Japanese people, probably instilled by the government to go countryside and work in a farm. Yes, Japan is not welcoming immigrants at this moment, but lack of labor force is a severe problem in the farming industry, and it’s part of government orchestration to promote farming among youth, eventually to achieve self-sufficiency, just as Abe Shinzou dictates that Japan should be independent from America’s post-war regime. So, that’s the background for this anime. Yes, Miyazawa Kenji life style I at some point in my life also yearned. Somewhere remote from a noisy busy stressful city life. But farming is 24/7 labor as the anime depicts. Has to be workaholic and in the end karoushi. So, I don’t idealize Miyazawa Kenji life style anymore. I rather be lazy, like Mio sings, “Please don’t say “You’re lazy!” I have the right to be lazy, so I exercise my right to be lazy, stay home and watch anime. The Japan’s post-bubble youth are disinterested, no clear picture of what they want to be. And I was like that during high school, I didn’t have any dream, as opposed to the 60’s youth who grew up with Dr. King’s “I have a dream” speech. The lost decades was pretty tough on us, and Eva came out around that zeitgeist, which made a lot of us turn into otakus. If you can’t have dream in 3D, then why not have fantasy in 2D? Yes, dream or fantasy, or in gendomike’s word, “promise.” We are the generation of dreamless, or hopeless. Of course they were some who had dreams despite the zeitgeist. I envied my classmate who went to Brazil to study soccer. I remember he was self-studying Portuguese. Well, my case, dreamless, rejected by the community, and then moved to somewhere remote like Tora-san sings, “Touku We Ikitai (I want to go somewhere remote),” yes to the continent of Columbus, or Columbia, particularly British Columbia (=”Anglo-America” or North America), yes NAFTA, particularly the United States, the promised land. So, Hachiken moved to Hokkaido, but me moved to America, Obama’s land. We are both disinterested and disengaged youth of Japan. So, I feel emotionally close to Hachiken, and this anime as well.